I’ll be honest. I love a good mystery. And lately, I’ve been on a huge (and long-lasting) whodunit kick. That’s part of the reason I haven’t written much lately: I find mysteries really hard to write about without giving too much away. It was generally agreed by the female residents of Meryton that Mr. and Mrs. Bennet of Longbourn had been fortunate in the disposal in marriage of four of their five daughters…A family of five unmarried daughters is sure of attracting the sympathetic concern of all their neighbours, particularly where other diversions are few, and the situation of the Bennets was especially unfortunate. In terms of Austen spin-offs, it was the best I’ve yet seen at recapturing Austen’s sardonic tone, and it convinced me to read more. For me, the mystery itself was somewhat forgettable, but, won by her writing from the first, I plunged onward, to Cover Her Face, the first in James’s series about Scotland Yard detective Adam Dalgliesh. After Cover Her Face, I decided that I quite liked this aloof, intelligent poet-detective, so I read on through A Mind to Murder, Unnatural Causes, and Shroud for a Nightingale. (I’m kind of a stickler for reading books in order.) 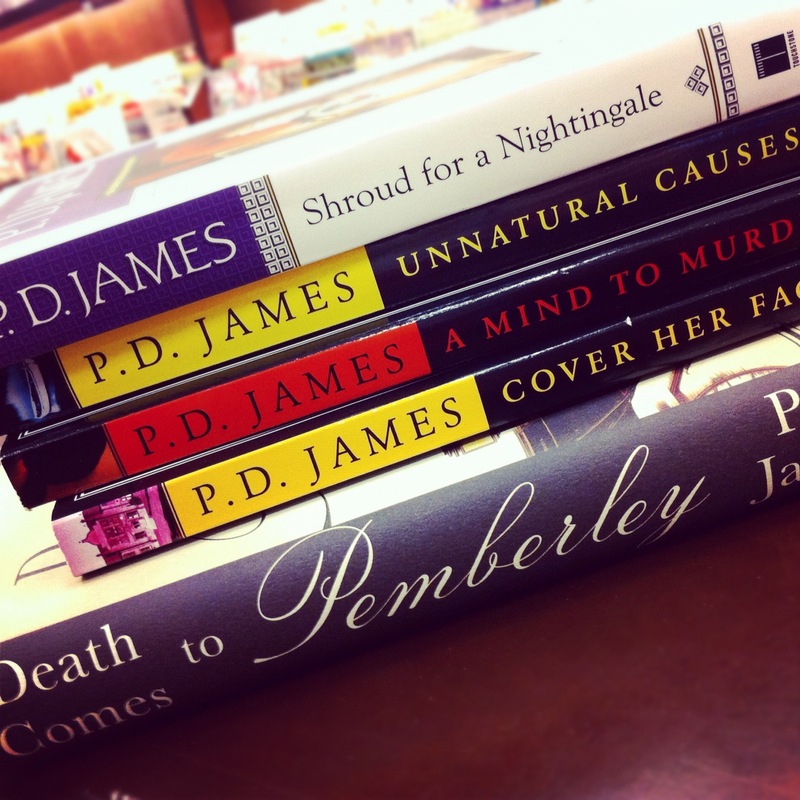 What I find so compelling about James’s novels is the strong, fine writing and the authentic characterizations. Although most of our time is spent with Dalgliesh, James adeptly moves from one character’s point of view to another’s, and each character’s reactions (as told or perceived) always feel real, and are often sympathetic in their own way. So far, I’ve also found her books to be richly atmospheric, with the place and circumstances of the murder contributing to a unique underlying sense of foreboding. The Black Tower, book number five, is waiting on my Kindle. Somewhere in the midst of my P. D. James foray, I decided I could no longer put off reading Josephine Tey, who, like Agatha Christie and Dorothy L. Sayers, is considered a queen of the Golden Age of Mystery. I started with Brat Farrar. One of my favorite authors, Mary Stewart, wrote a novel called The Ivy Tree as “fan fiction” for Brat Farrar, so it was high time that I made Tey’s acquaintance. 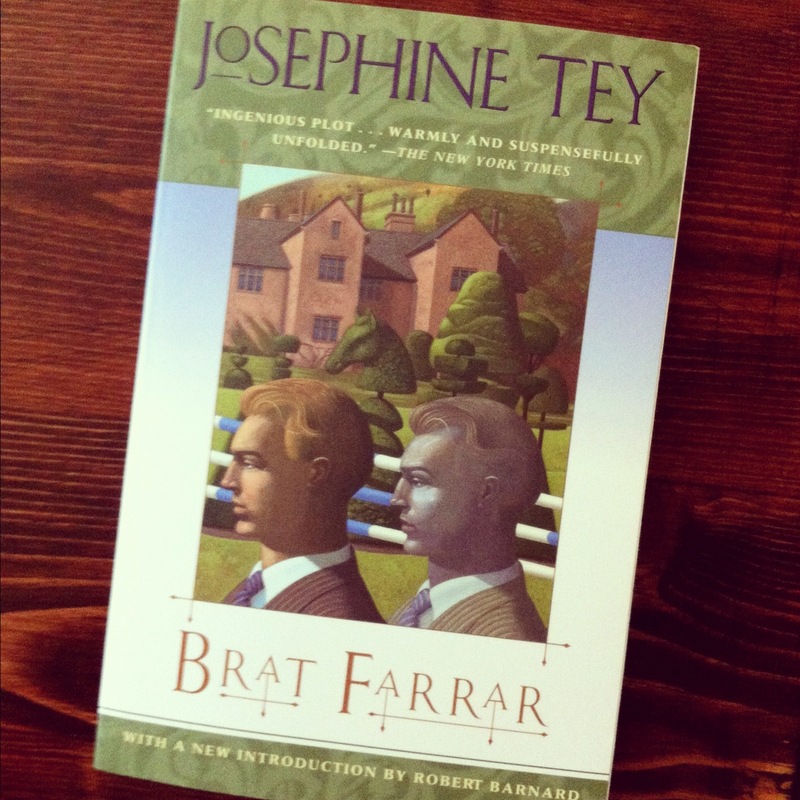 And I loved Brat Farrar. It’s the story of an imposter posing as the returned family heir, a boy who disappeared as a child and was presumed dead. But Brat Farrar was so much more than that. Josephine Tey had a gift for storytelling, for drawing you along and making characters real and sympathetic. My favorite part of this book – though this could be considered a spoiler – was that Tey never tells us how the murder was done. It’s a singular triumph, because the story still manages to be fully satisfying. I’ll definitely read more of Josephine Tey. It would be tedious to attempt a phonetic reproduction of Mr. Sage’s utterances. Enough to say that they were genteel to a fantastic degree. “Aye thot Aye heard somewon teeking may neem in veen,” may give some idea of his rendering of the above sentence. Hopefully, you get the (delightful) idea. So that’s most of what I’ve been reading of late. Have you read any good mysteries lately? This entry was posted in Books, Reviews, and Reading and tagged Austen spin-offs, books, Jane Austen, Josephine Tey, Lord Peter Wimsey, Ngaio Marsh, P. D. James, reading on August 18, 2012 by ms.grammarian. You got me started on Tey! I kind of love her. I started with “The Franchise Affair,” and found the following gems so far: “Lack of education is an extraordinary handicap when one is being offensive.” Also, “If he couldn’t be young and a poet, he could be a crutch. A dull thing, a thing resorted to only emergencies, but useful; useful.” And I’m not even halfway through… How did we not know about Tey until now? !